Tessa McBurney putting Best Management Practices in practice. 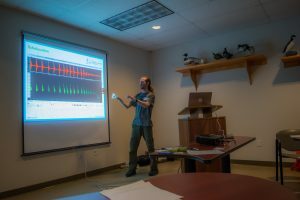 In March and Early April, the CWHC Atlantic’s bat health team delivered workshops in Newfoundland and Prince Edward Island to help pest control companies, provincial wildlife divisions, national parks, watershed groups, and public health departments better manage endangered bat species that roost in buildings. This initiative was achieved through the project Bats roosting in anthropogenic structures: “Building” a better understanding in Prince Edward Island and Newfoundland and Labrador through stewardship and outreach, which is funded by Environment and Climate Change Canada through the Habitat Stewardship Program. Little brown myotis (Myotis lucifugus) and northern myotis (Myotis septentrionalis) are both listed as endangered under the federal Species-at-Risk Act due to bat white-nose syndrome (WNS). Both of these species frequently roost in human-occupied buildings in the spring, summer, and fall, a situation which puts them in close contact with humans.The workshops emphasized best management practices that are conservation-oriented, with approaches that allow bats and humans to safely share a structure. However, recognizing the human health concerns related to bats, techniques for safely evicting and excluding bats were also reviewed. Lastly, ways of creating and increasing bat-friendly habitat on private properties were highlighted. Jordi Segers explaining bat echolocation. The one-day workshops were given in St. John’s (March 5th), Gander (March 7th), and Corner Brook (March 9th), Newfoundland, and Charlottetown (April 3rd), Prince Edward Island. A total of 85 participants learned about basic bat biology, the relationship between bat and human health, what precautions to take to work safely near bats, what local regulations apply to protect bats from harm, and regional and nationwide bat monitoring projects. 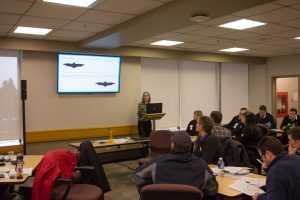 Most importantly, these workshops provided an opportunity to discuss the recommended best management practices for managing bats in buildings and to receive valuable feedback from pest control operators and other collaborators. It is imperative for the maximum protection of endangered bat species that those individuals whose work relates to bats in buildings accept and adopt these best management practices. It appears these goals are being achieved because preliminary feedback suggests the workshops were well received, and CWHC Atlantic has already had a bat specimen submitted for WNS surveillance by a pest control operator who attended a workshop. 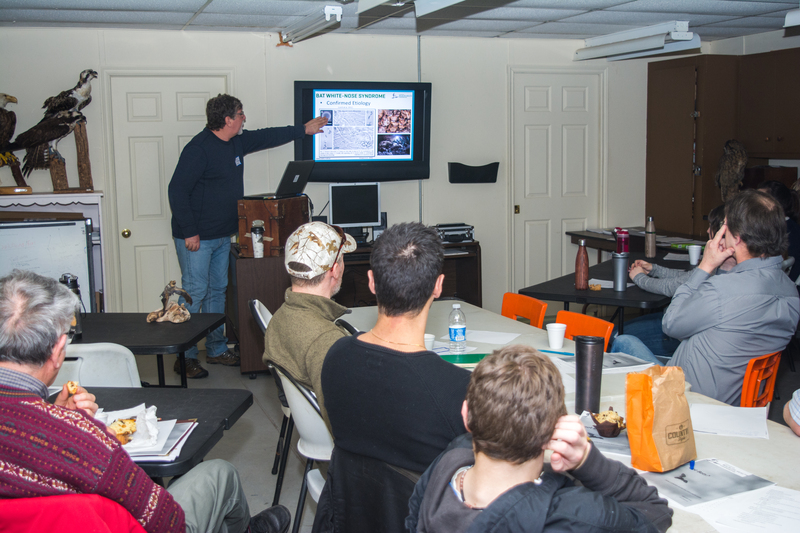 Scott McBurney talking about bat white-nose syndrome, rabies, and other bat and human health concerns. These workshops were hosted in conjunction with the following collaborators: Garry Gregory from the Prince Edward Island Fish and Wildlife Section, Jessica Humber and Shelley Pardy Moores from the Newfoundland and Labrador Forestry and Wildlife Research Division, and Susanne Tilley from the Newfoundland and Labrador Pollution Prevention Division. Tessa McBurney and Dr. Scott McBurney from the CWHC Atlantic Region, and Jordi Segers from the CWHC National Office were responsible for delivering the majority of the workshop content. Next story A new viral disease in grey squirrels?